uTorrent UltraBooster is a free add-on for the currently dominant BitTorrent client in the world, designed as an extra power tool for your download experience. It's like having Utorrent's main functions receive additional fuel - UltraBooster's technology makes it possible to improve your searching and increase the speed of your downloads by preventing traffic slowdowns and generally having your Internet connection work at its highest potential. 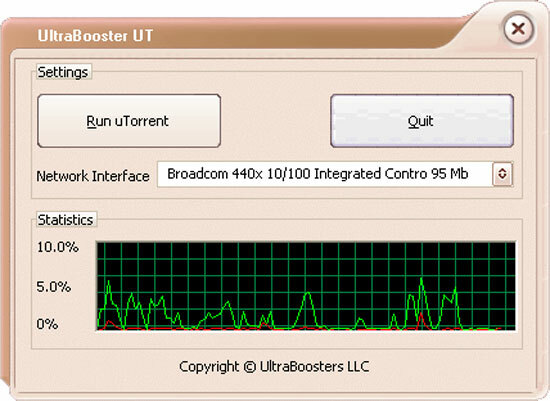 uTorrent UltraBooster is downloading optimizer, improving search and speed. All you need to do is install uTorrent UltraBooster (considering that you already have uTorrent client installed) and let it run unnoticeably in the background as it integrates to your p2p client instantly with no supplementary efforts from you or any skill altogether needed - it takes exceptionally little of both your space and your resources. uTorrent UltraBooster's simple window gives you access to its simple functions anyone can carry out - start program, stop, run, quit - but also presents you with all the useful information about the downloading process: bytes you send and receive, the interval of your download acceleration, the type of your Internet connection, info about the network interface. Qweas is providing links to uTorrent UltraBooster 2.2.0 as a courtesy, and makes no representations regarding uTorrent UltraBooster or any other applications or any information related thereto. Any questions, complaints or claims regarding this application uTorrent UltraBooster 2.2.0 must be directed to the appropriate software vendor. You may click the publisher link of uTorrent UltraBooster on the top of this page to get more details about the vendor.